I first heard about barberries from Milton Stricker, Seattle architect and Frank Lloyd Wright apprentice. I had a retaining wall, 30-feet long and 10-feet high, that posed a huge danger to anyone skiing, sledding, or just playing on the hill above. Milton suggested the hardy, deciduous barberry for safety reasons: adults and children will make a great effort to avoid walking into a thorny barberry! The added benefit was the beauty of those deep red branches flowing over a dark red brick wall. They come in mounding and columnar shapes, and can easily be pruned, increasing their health and vigor. Barberries are hardy in zones 4-8 and very low maintenance. Most exciting is the myriad of colors found in barberries: yellow, lime green, red, orange, pink, and burgundy. They will tolerate light shade, but full sun is preferred to produce the brightest colors. On a recent trip to West Seattle Nursery with Patty Campbell, my friend and a plant expert, we found a large selection of barberries to enhance our landscapes. Of all the varieties we found that day, these were Patty's and my favorites. This landscape staple grows slowly to about 5-feet high and wide. The leaves are dark variegated purple, but new shoots emerge deep rose with light pink and cream splotches. The shrub is deciduous, turning a showy red, orange and gold in fall and producing bright red berries in winter. This bright spot for the garden keeps its color all season and adds vibrant contrast to shrub borders. This dwarf golden barberry is only 12 inches tall and 18 inches wide at maturity. 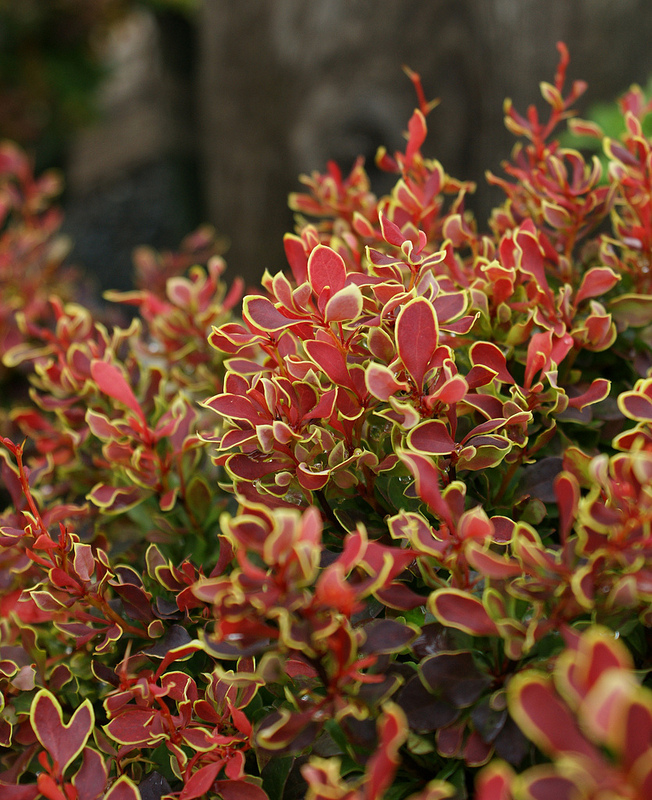 This 2-feet by 2-feet compact mound has colorful coral-orange foliage that lasts into autumn, then turns a brilliant mix of bright orange to brick red, accented with gold margins at maturity. These colorful shrubs are tough as nails, low-maintenance, versatile, and deserve a place in your home landscape. Just be sure to consider the thorns when siting them in your garden. West Seattle resident Patty J Campbell is a botanist and garden authority with forty years of experience in Western Washington landscapes. She is also a West Seattle Garden Tour volunteer, serving on the garden selection committee.